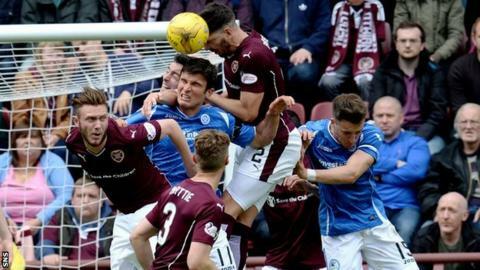 Scotland's team doctor believes football authorities should look at changing the rules of the game to prevent concussion. The United States Soccer Federation has outlined plans to stop children aged 10 and under heading footballs. Dr John MacLean is not in favour of such a ban but has called for an extended on-field assessment period for head injuries, currently three minutes. "In an ideal world, it would be longer," he said. "[A rule change] would need to be trying to limit any non-contact injuries. "Football's a contact game. We're not going to stop people clashing heads, but if we can limit the traumatic stuff, the illegal stuff game in the game, then we'd move forward. "One of the things that Fifa has done is outlaw what they call 'the elbow kick', which is basically that flailing elbow or that flailing arm. "Rugby's changed lots of things. American football's banned the spear tackle. "If we can change the rules, we can prevent head injury and we can understand the signs and get some good first aid at the side of the pitch, we'll have come a long way. "Similarly, with blood substitutions, I would like to see blood substitutions in football to allow the proper wound care." The three-minute assessment period for head injuries in football compares with 10 minutes in rugby. "The key here is that this is an assessment," Dr MacLean told BBC Radio Scotland's John Beattie programme. "This is not a diagnosis of concussion. "At the end of the day, if somebody's concussed then they're removed from the field. 'If in doubt, sit them out' is the guideline's mantra. "We're not actually looking at assessing how concussed somebody is. Concussion is a brain injury. There's not such a thing as a mild concussion." MacLean feels the Scottish Football Association is "ahead of the game" in terms of guidelines for young footballers and that, rather than a heading ban for under-11s, "we should look at the equally important parallel of head injury". "I understand it's a moving feast regarding the damage done by recurrent heading," he added. "There's no specific recommendation based on the science available. "We think we're the first in the world for a single country to have a set of concussion guidelines for grassroots sport. "The key thing is the recognition and removal from the field."